This rustic wrought iron oil lantern style ceiling light pendant in an antique finish is traditional and looks authentic. Ceiling cup and chain suspension, with detailed scrolled metal work supports, oil resevoir and shade gallery. Fitted with an opal white glass outer shade and clear glass inner chimney. 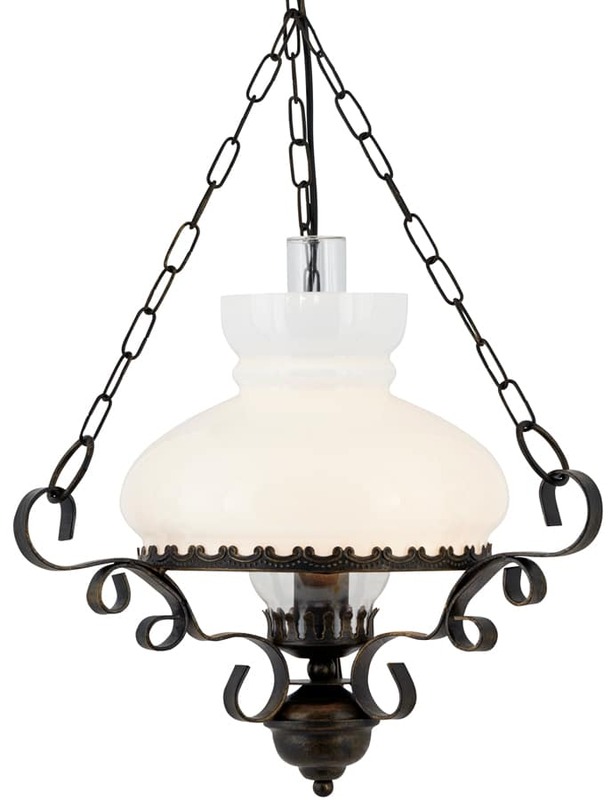 An ornate wrought iron effect fitting hanging from three chains, which looks just like a real oil lantern but uses modern electrical lighting to brighten any room. Height adjustable at the time of installation by simply shortening the length of the chain suspension; please see the technical information below for dimensions. Supplied by Searchlight who manufacture some of the best traditional and modern classic designs such as the rustic wrought iron oil lantern style ceiling light pendant you see here.